One of the goals of the UU Humanist Association is to put our humanist values into action. This page highlights recent social justice projects we have initiated. As part of the UU Humanist Association's involvement in the UU climate justice collaboration, Commit2Respond, we're sponsoring the project Save Our Ailing Planet. Available without charge to food pantries, shelters and soup kitchens. Donated by members and friends of Unitarian Universalist Humanists. We chose Method soap company, a B-Corporation, because of their support for local jobs, renewable energy, green manufacturing, and other socially and environmentally responsible practices. Method dish soap is a biodegradable, non-toxic, plant based product. It is made in the Chicago area (Pullman) in a LEED-platinum certified factory in a low income Chicago neighborhood; it is packaged in recycled and recyclable materials; the water used in the manufacturing process is also recycled. The workforce is heavily local, as is the power source for the factory, with onsite wind and solar making up a major proportion of the energy consumed. The factory has large rooftop hydroponic greenhouse providing local residents and institutions with fresh produce. The roof space also hosts several beehives. Bike parking and showers are available for workers who pedal to the job. 18oz bottles of Method’s dish soap are purchased in quantity using donations from members and friends of the UU Humanists, and from individuals in the areas served by recipient groups. If your group wants to include an eco-friendly dishwashing product along with the food and other kitchen supplies that you distribute without charge to members of the public needing food assistance, or if your group needs dish washing supplies as part of a shelter or kitchen operation for the hungry or homeless, we would like to supply this product without charge. Make a six dollar gift and UUHA will deliver a bottle of dish soap to the Morgan Park Food Pantry on Chicago’s South Side. Able to do more? Up your gift to $11 for two bottles, $24 for five, $48 for ten or $96 for twenty. So that we can tell that your donation is for the S.O.A.P. project, please make it exactly, $6, $11, $24, $48 or $96. Please contact Rev. Roger Brewin, rabrewin@aol.com, with questions. Help us support local jobs, renewable energy, green manufacturing and the work of serving our community, to which you are already committed. 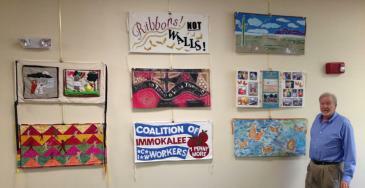 Ribbons Not Walls uses fabric arts and literature to call attention to the needs of immigrants in our society. We currently have three activities under way that gently tie connecting ribbons between Unitarian Universalist congregations, humanist groups and Hispanic communities across the country. This project involved 400 individuals each “SmUUggling” one book from among those removed from Tucson classrooms by the State of Arizona, when it outlawed the teaching of “Ethnic Studies.” Multiple copies of more than 80 titles (mostly by Hispanic authors) were put on display at our General Assembly (GA) booth in Phoenix in 2012, then were donated to the Puente organization to start a new community library. For this project, we collected requested titles for the Puente library’s younger readers. At the 2013 Louisville GA, we created another community library, in a location determined by our local Hispanic partners. Ribbons is a fabric arts/social justice work – we’ve asked dozens of local artists and fabric art collectives to each construct by one fabric art panel (a yard long by 18” high) reflecting a theme (or cover art) from any of the designated Banned Books or children’s books, or depicting any immigration rights project being conducted by a UU congregation or humanist group. These panels make up a "ribbon" that has been displayed at the 2013 Louisville and 2014 Providence GAs, in the UU Humanists booth and paraded by youth at several GA events. Roger Brewin has also taken the Ribbons art display on tour and has spoken to many UU congregations about the injustices that many immigrants face.